Much has happened since the last time I analyze Masteel. Today I have done an analysis on Masteel as well as other steel counters such as Ann Joo, Lion Industries and Southern Steel. You can check out the video below for the analysis. Malaysia steel's share price has been trending up very nicely since 2017. A stock that is in an uptrend is great for buying the dips and breakouts. Masteel is one of those stocks that offer traders lots of opportunities to buy the dips. A beautiful trending up stock is the easiest to play. Compared to a stock that is in a downtrend, a trending up stock is much safer as you will not be trying to catch a falling knife. I have always found it beneficial to analyze Malaysian stocks. The extra work that is put in is never wasted as every single analysis that I do increases my knowledge so much that I'm beginning to be able to have a feel of Malaysian stocks the way I do with Nasdaq 100 stocks, S&P 100 stocks and Dow 30 stocks. I mainly trade those 230 stocks. Actually they overlap. So its a bit less than 230. To me, specialization is more important than anything in the stock market. Even the great Warren Buffett limits his holding to a handful of stocks and not chase after thousands of stocks that are available in the world. Sometimes when I look at a probable trading setup in the stock, I don't want to take it because familiarity with that stock makes me have a feel that it might not work out very well. The chart above is the daily chart of Masteel. This is a picture of a beautiful uptrend. Many of us are able to spot a beautiful women or a handsome man. Some are even able to spot a very rich man even if that man is just wearing a singlet and shorts walking around in his orchard digging up vegetables and driving an old rusted car. But how many of us really learn how to spot a rich stock? We all like to buy downtrend stocks don't we. Hoping that the frog will turn into a prince when we kiss it. But the secret of making money is to look for uptrending stocks. Masteel is one of them. There are 2 ascending triangle breakouts. There is also a dip to the 50 MA buy setup for traders. The recent one is the dip to support buy setup. The stock is trending up and as always I like to remain bullish on a stock that is staying above its rising 50 MA and rising 200 MA. If the stock is able to stay above the recent support area, the path of least resistance is still up. A stock that is trending up will usually continue to trend higher. At the moment I do not see any weakness in the share price of Masteel. 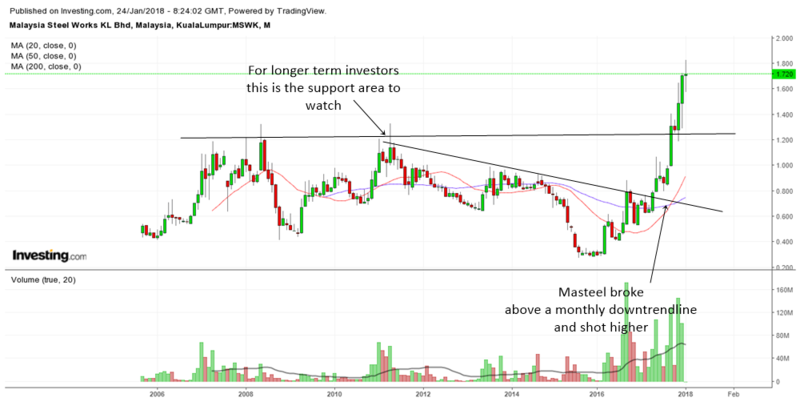 Zooming into the 60 min chart of Masteel, I'm amazed at the endless opportunities in the Malaysian stock market for the sharp eyed trader. We have 2 ascending triangle setups. One in December, the other one recently. The recent one is still in its infancy stage. I don't know whether it will give birth to a handsome profit as the last one or not. 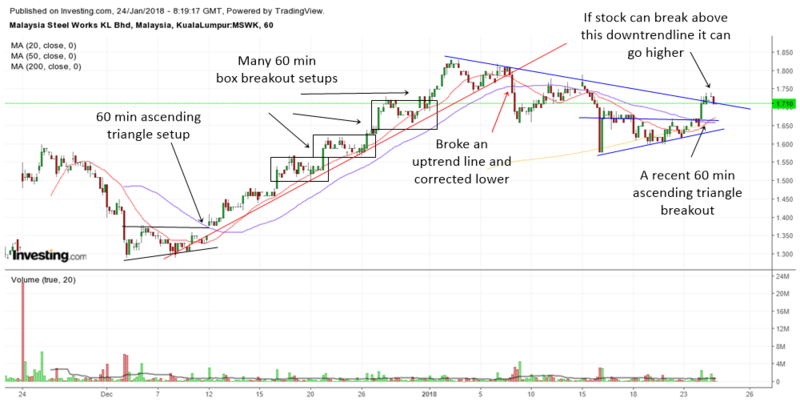 The recent 60 min uptrend provided tons of continuation patterns to play. At this moment, if the stock can break above the 60 min downtrend line then it can continue to move higher. Moving on to address the concerns of the rich and long term investor, we need to look at the monthly chart of Masteel. It is very true that investors tend to make long lasting profits than the uninformed person who trades in and out of stocks. That's because they have the patience to sit through corrections and at the same time they eat the dividend. 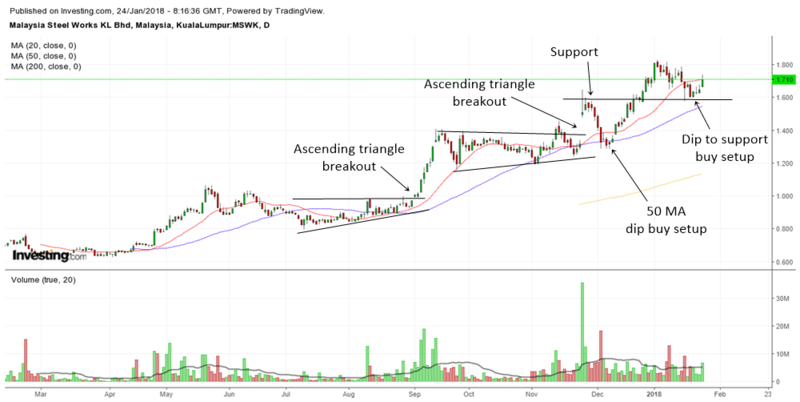 Malaysia steel broke a monthly downtrend line and that is when trouble started for people who wished the stock to go down. Breaking a long term downtrend line is often a catalyst for a major bull run in a stock. You can see that the 1.20 area is the powerful long term support for this stock. As long as the stock stays above this area, the long term investor should not worry at all. Keep on holding the stock and it will continue to go higher as long as the 1.20 area holds.